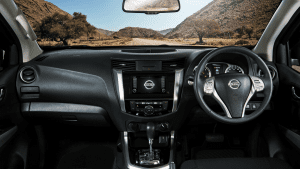 In September, I took the Nissan Navara automatic variant for a spin and found it to be an awesome all-round 4×4 experience. However, I wanted a closer look at the top of the range 4×4 LE Manual Navara, and as such, met up with Group 1 Nissan at the Glen to do so. Sudesh Nadersen, the well-versed Sales Executive, noted that for him, the smooth ride and comfort of the vehicle stands out, giving an SUV-like feel – he was eager for my opinion and I happily obliged, taking it for a test drive this month. As in the previous review, the vehicle itself is a handsome, rugged bakkie that gives the immediate impression of confidence in its capabilities. I loved the hardy, rugged body that – when slipping into the leather-clad interior – belies that fact that you are (for all intents and purposes) driving a bakkie. It feels more like a sedan or SUV crossover, with its lovely finishes and quality interior. Speaking of SUV-like qualities, Sudesh informs me that the reason for the velvety smooth drive (with minimal bumps and bouncing) is due to the coil springs having replaced the leaf springs of the previous Navara range – Sudesh has two years’ experience with the Nissan brand, and notes that Nissan has put a lot of effort into this specific suspension system. 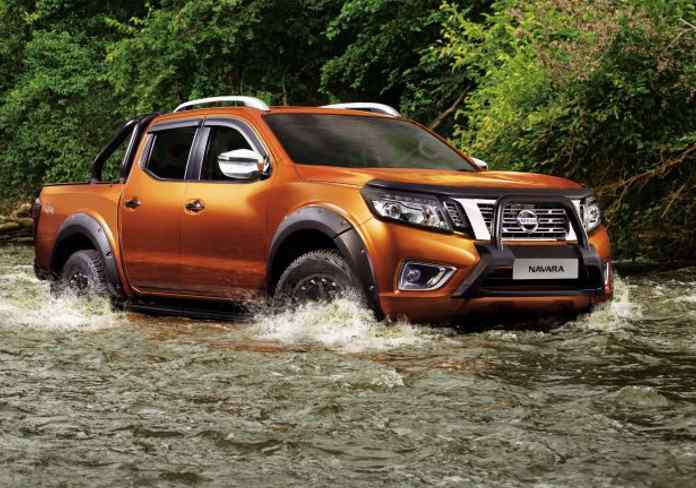 With this variant launched in March, the Navara is making waves for its fresh and modern approach to off-road vehicles. A centre console is conveniently situated, giving my easy access to whatever I need to improve my drive experience, including a touch screen. Initially I was doubtful of the manual, because in my mind, a manual 4×4 bakkie would be rickety, hard and somewhat uncomfortable. I was wrong – I set off in a crisp white Navara that immediately impressed me with a great, comfortable and effortless take-off, and a soft, even gentle, ride. It felt great on the open road, and equally smooth on rougher terrain where it handled bumps, jolts and uneven surfaces with grace and minimal jiggling. 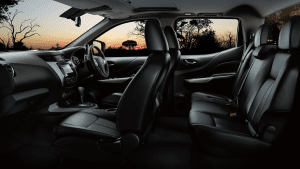 The cabin was also surprisingly quiet, very spacious and – true to the words of the team at Group 1 the Glen – truly felt more like an SUV than a bakkie. Dealer Principal, George Stegmann, has been with the Nissan brand for 25 years, and is the epitome of what the brand stands for – loyalty to customer satisfaction, quality vehicles that are reliable, durable and innovative products and services designed to enrich people’s lives.